Marisol Luna is a Spanish 10 year old who lives in Chicago. She’s in the fourth grade. Marisol was born to dance, it’s her favorite thing in the world to do! She takes tap, jazz, ballet and folklorico lessons. It’s hard work, but if she keeps it up, she can be a real dancer. Marisol lives with her loving parents in a busy and large Hispanic town in Chicago. Marisol Luna was introduced December 27, 2004 and became retired December 15, 2005. November 11, 2007. American Girl of the Year, History of the dolls, Retired items. 20 comments. September 22, 2007. American Girl of the Year, History of the dolls, Retired items. 3 comments. Jess Mconnell is a adventurous 10 year old girl and ready for anything. From the moment she steps off the plane and into Belize she wants to explore. Her Irish American dad and her Japanese American mom both love archeology and exploring, they came to Belize to spend five months at the ancient Maya ruins. It’s Jess’s first time being out of the United States, her first time being home-schooled, and her first trip without her older brother and sister. Jess was girl of the year 2006 and she is now retired with the exception of her book. 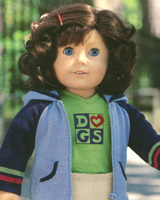 photo courtesy of the complete guide to American girl collecting. September 14, 2007. American Girl of the Year, History of the dolls, Retired items. 3 comments. Kailey Hopkins is a ten year old water girl, in the sense that she loves to go boogie boarding in the salty ocean more than anything in the world. Very soon the trouble starts with a development that wants to destroy her beach and Kailey has to use courage she never knew she had to save the thing that she loves most. Kailey was introduced in the summer of 2003 the next year in July she was retired with the exception of her book. September 8, 2007. American Girl of the Year, History of the dolls, Retired items. 7 comments. American Girl company has retired a lot of items some from every historical girl, except best friends. Even the today girls have retired items. Felicity is one of the dolls who has the most retired items probably because she was the first doll to come to the historical collection. Samantha has some retired items but she is a very popular doll so they don’t retire many things from her. Molly has even more retired items than Felicity. For Molly they retired items and then made them differently. Kirsten has a fair amount of retired things but if you look on Ebay most of them are there.I think that they retired most of the good things, sometimes I look on Ebay to see if there is anything good. Josefina has so little retired items it is hard to believe. Again I think they retired the good things. Addy’s retired items are pretty easy to find on Ebay. American girl did not retire so much of Addy’s things. Kit has only four retired items! that is great for her, but you never know they could retire anything at anytime. Kaya has only two retired items! 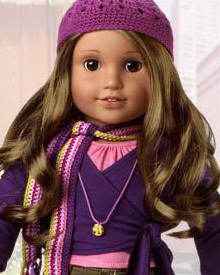 But then she been around for five years, unlike most of the dolls who aren’t best friends Kaya only has five outfits. the today dolls have so many retired items I cannot count them. August 6, 2007. Retired items. 23 comments.